Air, land and water are the three essential elements around which diverse life forms on our planet thrive and survive. Precious human life needs to be protected against the challenge mounted by microbes in day to day life as well as professional settings. Build up of resistance and development of resistant strains continues to challenge preventive healthcare and infection control professionals globally. Sensing the urgent need for good quality products for infection/contamination control in the in-vitro segment, BioShields® has researched, designed and developed novel, potent, effective and safe disinfectant and antiseptic solutions. 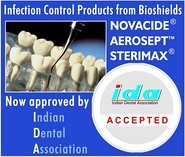 BioShields® products are FDA(India) approved and effective against all pathogens including Methicillin-Resistant Staphyloccocus aureus (MRSA), Vancomycin-Resistant Enterococci (VRE), Multi-drug resistant M. tuberculosis, Glutaraldehyde-Resistant M. Cheloni, M. Fortuitum, Multi-drug resistant Gram -Ve E. coli etc.